Last week, we discussed the political implications of Texas choosing to secede from the Union, something which — as is apparently unknown to its governor Rick Perry — it has no more and no less right to do than any of the other 49 states. What Texas could choose to do, however, is to divide itself up into as many as five states, a privilege given to it as a condition of its annexation to the Union in 1845. What would Texas look like if it chose to do this? Would dividing a large, red state into five smaller, reddish states benefit Republicans in the Senate? In the Electoral College? The answers are not so clear. But first things first, we need to come up with a logical way to divde Texas into five parts. The principal challenge we encounter is that Texas’ population is not distributed very evenly throughout the state. Texas has about 24 million people; divided into five equal shares, that would translate into roughly 4.8 million persons per entity. The Dallas-Fort Worth area alone, however, has more than 6 million people, while the Houston metro is at almost 6 million. When dividing Texas’ population, therefore, we either have to cleave up these metro areas or accept the fact that the new states will have somewhat unequal populations. I choose to take the latter course, figuring that the good folks of Dallas and Houston probably wouldn’t take kindly to having their friends, neighbors, and places of work split up across state lines. This is a map — adapted from the New York Times — of county-by-county results for Texas’ presidential vote in 2008. I have divided Texas into five states along county boundaries, each of these new states would have a somewhat unique set of political and demographic characteristics. Technically speaking, Texas does not have the right to divide itself up into five new states. Rather, it can spawn as many as four new states; whatever is left over would be called ‘Texas’, although for clarity I refer to this region as ‘New Texas’. This portion of the state gets to keep the Texas moniker because it contains the current state capital, Austin, and because it is in the middle of Texas’ present territory. However, it would actually the smallest, area-wise, of the five ‘new’ states, at about 25,000 square miles. New Texas would, however, be a swing state, its eight electoral votes in play as Democrats fought to turn out enough votes in Austin and the Hispanic portions of San Antonio to fend off a heavy Republican advantage in the suburban and rural portions of Hill Country. In 2008, Democrats would have lost that battle by the slimmest of margins, with Obama being defeated by McCain by around 7,000 votes, although the advantage could easily have shifted from one party to the other depending on how exactly New Texas’ boundaries were drawn. This region’s name, Trinity, is a sort of triple entendre, referring to the Trinity River that flows through much of the region, to the ‘trinity’ of cities (Dallas, Fort Worth, Arlington) that make up the DFW metroplex, and as an homage of sorts to the region’s undoubtedly fairly high numbers of religious voters. Trinity would be the wealthiest of the new states of Texas. It would also contain a relatively large African-American population. Democrats, however, would have little chance of competing for its 12 electoral votes, at least in the near term. Although Barack Obama won Dallas County on November 4th, it was literally the only county that he won in the region, and overall the region would be a point or two redder than the current state of Texas is as a whole. Democrats might have a opportunity, however, at picking up one of its two Senate seats — they currently hold about one-third of the senate seats in states where they are at roughly this degree of partisan disadvantage (think Arkansas or South Dakota). This somewhat unusually-shaped state, which looks a bit like West Virginia rotated 90 degrees, would contain the Houston metroplex, while then meandering to include nearly the entirety of Texas’ Gulf Coast, from the Louisiana border up to (but not including) Texas’ southermost reaches in Cameron County. Gulfland’s economy would likely be heavily dependant on offshore drilling platforms in the Gulf of Mexico. However, there are a few things for Democrats to like about Gulfland — it would be a majority-minority state (although barely) and Barack Obama won Houston’s Harris County in November (also barely). Gulfland might be incrementally more competitive than Trinity, although very likely only for the Senate and not the Presidency, as Democrats have been gradually losing ground in this part of the country. I have drawn Plainland’s boundaries as generously as possible to extend beyond the Texas panhandle to include mid-size cities like Waco and Wichita Falls. Nevertheless, while containing more than 40 percent of Texas’ former territory, Plainland would have barely more than 2.5 million people. It would also be an exceptionally conservative state — quite possibly the most conservative in the country, as John McCain defeated Barack Obama here by nearly 3:1 last November. Five electoral votes, two Senators and three congressmen would be all but certain for the Republicans. To our final region we give the ironic name El Norte — ironic because, although ‘El Norte’ is the Spanish term for ‘The North’, this would actually be Texas’ southermost (and westernmost) region. But it would be impossible to define El Norte by anything other than through reference to its Hispanic culture and its proximity to Mexico, as about 85 percent of its residents have Hispanic ancestry. 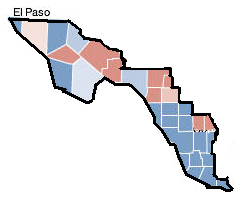 El Norte would also be the poorest state in the Union, with one-third of its residents living below the poverty line. Electorally speaking, El Norte wouldn’t be highly competitive — Democrats would win Presidential and Congressional elections going away, until and unless the GOP found some better way to reach out to Latino voters. It might, however, become a focal point for Republican angst about immigration, bilingualism, the welfare state, and other issues. Texas currently holds 34 electoral votes, 32 for its Representatives and two for its Senators. These electoral votes have been won by Republicans every year since 1980 and look to be relatively safely in the Republican column for at least the next two elections, although a Southern or Hispanic Democrat might have a chance at them in play given an excellent overall year for the party. If Texas were divided into five states, its number of senators would increase from two to ten, and its number of electoral votes from 34 to 42. This would seem at first glance to benefit Republicans, but it actually might not if the state were divided along the lines I have suggested. This is because, if Democrats merely won El Norte (5 electoral votes), which they would be almost assured of doing, they would give up a net of 32 electoral votes to the Republicans (37 less 5), which is slightly better than the 34-vote gain that Republicans get by winning Texas currently. If Democrats also turned out enough voters in Austin to win New Texas (8 electoral votes), moreover, this would really put the Republicans at a disadvantage, as they’d then gain a net of just 16 votes (29 less 13) from Texas’ former territories. Texas will gain additional electoral votes — probably four although possibly just three — from the re-apportionment following the 2010 Census. Those additional electoral votes would be awarded, in order, to Trinity (giving it 13 electoral votes rather than 12), Gulfland (likewise), El Norte (6 rather than 5) and Plainland (ditto); New Texas would have some ways to go before picking up a 9th electoral vote. The disposition of four of the ten Senate seats from the new states of Texas would be foregone conclusions; Republicans would win the two seats in Plainland, and Democrats would win two from El Norte. The senate seats in New Texas would most likely be split, while on average the Democrats would stand to pick off one of the four Senate seats between Trinity and Gulfland. This would give them a total of 4 seats to the Republicans’ 6, a net loss of two seats that is no worse than the 2-0 disadvantage they are operating from currently. However, the shift in the senatorial balance of power would be slightly unfavorable to the Democrats overall, as the eight new senators created would increase the number of votes required to break a filibuster to 65, leaving the Democrats two votes short of a filibuster-proof majority, even if they managed to add four senators from the region. In addition, it is not out of the question that Democrats will gain Kay Bailey Hutchison’s seat in the status quo if and when she decides to run for governor in 2010. The effects on representation to the House would be relatively unchanged. Texas would neither gain nor lose House seats if it split itself five ways, although many Congressional District boundaries would need to be redrawn, which might benefit Democrats in the very near term as the 2003 redistricting plan was quite unfavorable to them. Of course, one could easily draw Texas’ new boundaries in any number of ways other than how I’ve drawn them. 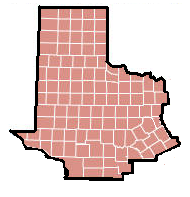 For example, if one wanted to create five states of roughly equal population, Fort Worth and Arlington could be split from Dallas and given to Plainland, while everything to the immediate west of Houston’s city center (meaning suburbs like Sugar Land and Bellaire, as well as Gulf Coast cities like Corpus Christi) could be adjoined to El Norte. This would make El Norte somewhat competitive for Republicans, although Democrats would still probably be favored and the Republicans would be putting more electoral votes at risk. The net effects on the other new states would be relatively minor, although Democrats might become incrementally more competitive in Gulfland. Overall, dividing Texas into five states would probably slightly hurt Democrats in the Senate while slightly helping them in the Electoral College. That’s not much of a rationale for Republicans — or anyone, really — to mess with it.